Ramen are not always eaten hot, even in cold countries (japan does become very cold in some areas in winter, I can guarantee you!). 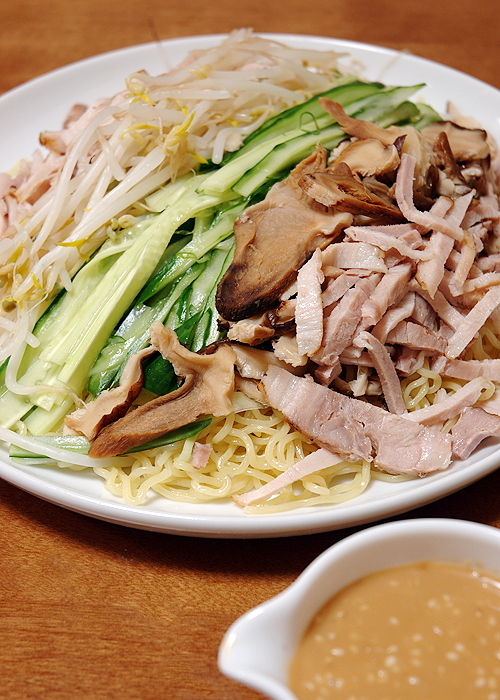 Be it hot or cold, Cold Ramen, Hiyashi Ramen/冷やしラーメンare a very popular dish here. Here is the basic (classic) recipe with some different sauces. I have left the precise quantities again to your preferences. I sincerely hope it will help! Choose the short, crispy Japanese variety. First massage them with salt. Wash them under cold clear water. Slice along their length at a slant and cut the slices into long thin strips. Do choose them fresh for best taste. Plunge them into hot water and stir them a while. Drain them thoroughly and let cool completely. Let the shiitake swell backto their original soft size in lukewarm water. Boil them for 5 minutes then. Drain thoroughly and let cool down before slicing them thin. Cut as much as you want into thin strips. If unavailable, ham is fine. Do experiment with quantities. Have a good look at picture, too! In a bowl, mix soy sauce and peanuts butter (the less sweet kind if osiible) until you attain a creamy sauce. Add sesame oil and a little and mix well again. Add some water and mix well (to lighten it). Add a little rice vinegar for seasoning and mix well again. Pour the sauce into a mortar. Add sesame seeds and crush/mix with a pestle. Depending on your preferences, you can add chili pepper, or a drop of tabasco. If the taste seems a little bland, add rice vinegar and soy sauce. In a bowl drop Doubanjian, Japanese sake, soy sauce, rice vinegar, sesame oil and water. Mix well! You may add liquid lard for a deeper taste. in a bowl drop soy sauce, sugar, rice vinegar, Japanese sake, sesame oil and water. Mix well. If sauce is too thick, add water. In a large pan bring to boil plenty of water with a little salt. Throw in the ramen after having made sure they don’t stick to each other. Control the heat so as not bringing the water back to boiling point. Cook until slightly hard or very firm. First drain thouroughly, then wash under cold running water. To prevent the ramen from sticking to each other, add a little sesame oil and mix well. Boil the ramen after all the other ingredients are ready for fast and best sevice. Place the ramen in the middle of a plate and cover them with cucumber, beansprouts, shiitake and char siu as decoratively as possible and serve with sauce in a separate dish. -Many restaurants serve the cold ramen seasoned with their sauce. This is not a very good idea as the ramen will end up impregnated and softened. Add sauce little by little with a small spoon from the sauce dish. It might take more time, but it will far more delicious. -You can of course use other ingredients as far as the vegetables are concerned. Let your imagination fly. Just make sure they are cut in strips all apprimately the same size! -The Japanese often add hot mustard just before eating them Experiment!